Spring has (finally) sprung! And it is my favorite season, so get ready to see tons of recipes that take advantage of all the produce - asparagus, peas, artichokes, strawberries... We had an unusually cold winter here in Atlanta, so I can't even begin to tell you how happy I was today when the high was 75. Love it! What I don't love, however, are the allergies that come along with the beautiful weather. As a matter of fact, I have had some serious allergies over the past few days, and the day I made this soup I was so sick, and really just wanted comfort food. I didn't have too high of expectations, for a couple of reasons. For one thing, while I do like peas, I didn't know that I would like them as a main ingredient. I also was a little unsure of the mint. I love mint flavored desserts, but I was afraid it would overpower the delicate flavors of the vegetables. On the contrary, I think it just gave the whole soup another boost of flavor, and it really just tasted nice and fresh. 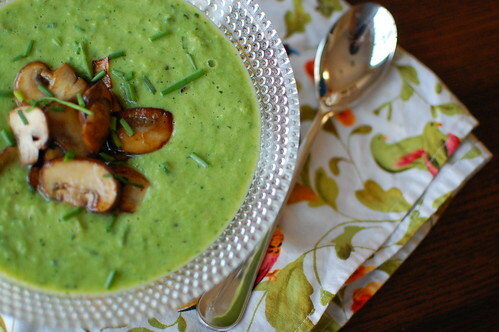 This recipe is from Ina Garten, and its actually called Fresh Pea Soup. However, I also added asparagus, and I topped it with some sauteed mushrooms. I saw a similiar recipe in Better Homes and Gardens that had these as a garnish, and I loved the idea. On a day when the temperature is in the 70's, I certainly didn't want a heavy soup with rich ingredients. This soup was comforting and tasty, but still very light and fresh. I gave a bite to Caroline, and she kept coming back more more! 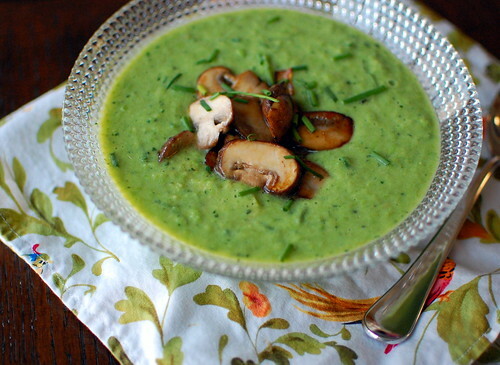 And as shallow as it sounds, I think my favorite part of this soup is its gorgeous bright green color! Heat a large saucepan or stockpot over medium-low heat. Add the oil, and heat until shimmering. Add the leeks and onion, and cook for 7-10 minutes, until the onion is tender. After 2-3 minutes, add the asparagus, and stir often. Add the chicken stock, and increase the heat to medium-high. Bring to a boil, and add the peas. Cook for 3-5 minutes, or until they are tender (if using frozen peas, they will only take 3 minutes). Take the soup off heat and add hte mint, salt, and pepper. Place 1 cup of soup in a blender, and puree on low speed. With the blender still running, open the venthole and slowly add more soup, a few ladles at a time. Continue to do this until the blender is 3/4 full. Pour the soup into a large bowl and repeat until it has all been pureed. Melt the butter in a small skillet. Saute the mushrooms until they are brown and softened. Whisk in the Greek yogurt and chives, and taste for seasonings. Serve hot, topped with mushrooms, and sprinkle with additional chives. I love mint & peas! This looks super. This looks really good, I think I will try it soon. Finally got around to making this tonight, and it was so good, especially with the mushroom garnish. My 18 month old daughter loved it- she didn't want her grilled cheese, just this soup!